Do you love gaming & geek culture? 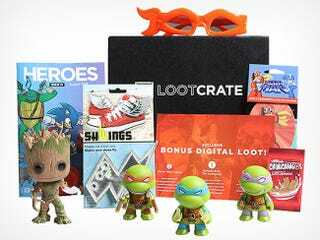 Check out Loot Crate's subscription service — and this exclusive discount on a 3-month membership. Loot Crate sends out a bunch of gear to your door every month, and the content is always a mystery. But each month's theme is announced in advance, and looking at previous months gives you a good idea of what to expect — awesome collectibles, toys, apparel and art, including plenty of exclusives.